After recently having time off for knee surgery it is certainly great to be back at work seeing the fantastic things that are happening here at the College with our staff and students. Ōtaki College is now a demonstration school for School-wide PB4L (Positive Behaviour for Learning) which is about creating a solid foundation for respectful, caring, collaborative and productive relationships. The programmes, the research, the resources and shared practices we are developing within PB4L are all focused on creating a strong, healthy platform of behaviour and social interactions within the College and ultimately our community. Over the last few weeks there has been a PB4L competition has been running in the college and it was fantastic to see students and staff really making an effort to develop our school wide expectations so that they had a visual impact in all our working spaces. My sincere thanks to Ms Brown and PB4L Committee for the effort they put into running the competition and undertaking the hard task of the judging. As a parent you may well not be aware of how NCEA operates but it is critical that you gain some understanding around this so that you can have continued meaningful conversations with your child. This will enable you to become aware of how well they are doing and to encourage further progress. If you want to know more about NCEA and you want to see how well your child is doing then NZQA have announced that the NCEA Student App has been officially launched. It complements the NCEA Guide App launched, last year, by NZQA to assist parents and employers to understand how NCEA works. The free NCEA Student App has been developed to help students track their NCEA credit progress and set goals for their NCEA achievement. Although there are other apps available to students, the NCEA Student App provides an officially maintained database of standards and a goal-setting function. We encourage students to look at all the apps available and to use the one that suits them best. The NCEA Student App will help students, parents, schools and whānau track learning progress and encourage excellence. All content is available in English and Te Reo Māori. The NCEA Student App is free to download from the Apple App store and the Google Play Store. More information for students, teachers, parents and whānau is available on the NZQA website at www.nzqa.govt.nz/student-app . On the recent Teacher Only Day, Ōtaki College Teachers combined with staff from Waitohu and Ōtaki Primary to continue to develop skills to deliver the curriculum with the assistance of eLearning tools such as Chromebooks. Pen and paper is still used in classes but the possibilities of eLearning apps and tools opens the classroom to many opportunities that have not been possible before. Staff ended the day with new knowledge of how to use these to better improve student learning. Wallace Trickett, local resident and renowned painter, has been a frequent visitor to the College in recent weeks. He is assisting a group of Year 10 students complete a series of murals celebrating the links between Ōtaki College and Robert Gordon’s College in Scotland. The murals commemorate the history of the Ōtaki Scholar and mark the new chapter in the two schools’ relationship that began in 2013 with the establishment of the Sander Scholarship. the ŌC crest and the Sander Tie crest/logo. Upon completion, scheduled for mid July to coincide with the visit of the 72nd Ōtaki Scholar, the murals will be installed in the College hall. The College would like to thank Wallace Trickett, Chris Parkin (former student) who owns the Museum Art Hotel and has funded this project and Conor Colbourne/Ōtaki Hammer Hardware who have donated all the materials. Year 11 Digital Media students, Andy Tam, Thomas Abel, Michael Cooper and Shania Sharrem with their teacher, Stephen Aitken, will be attending a red carpet premiere screening of their very own film at the Roxy Cinema in Wellington on 2nd June. The students have made it through to the finals of the Roxy5 secondary school film competition which called for an original film based on the theme “150 Years of Wellington”. The overall winner will be chosen by a panel of professionals from the Wellington film and media industries and will be announced at an award ceremony following the June screening. A College team consisting of Claudia Allen, Lauren Blakeley, Kaitlin Freeman and Ande Hakaraia competed recently at the Kyrewood Interschool Equestrian Event, coming 3rd out of 25 teams. The girls all competed in Dressage, Show Jumping and Hunter Trials. OC Team, 1st Hunter Trials. On May 4th, the Level 2 Outdoor Education classes departed on their Central North Island trip. This trip involved; caving, climbing, abseiling and walking the Tongariro Alpine Crossing. The first activity was caving in the Okupata Caves in the Tongariro Forest. Here students crawled through underground streams into Glowworm caves and came face-to-face with Cave Wetas. The next day the group visited Kinloch on Lake Taupo, experiencing their first day of outdoor climbing and abseiling. On Wednesday the group walked to Red Crater on the Tongariro Alpine Crossing looking into a live volcano and walked in 50 km/h winds. 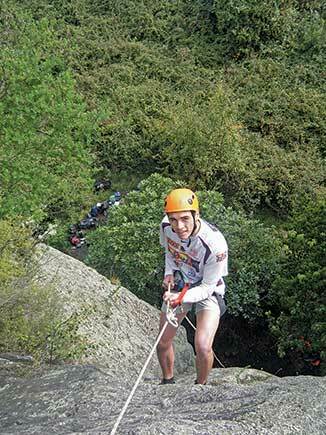 The final day was a full day’s climbing and abseiling at Vertical Assault in Turangi. The Outdoor Education Department would like to congratulate all the students for their efforts and achievements. A big thank you goes to parents Mike Edginton and Jeremy Crowe for their support and Taylor Memorial Lodge and Vertical Assault Climbing Wall in Turangi.